Statice blue(4 pt. ), Carnation green(5 pt. ), Chrysanthemum spray pink (4 pt. ), Сhrysanthemum green(4 pt. ), Rose white(5 pt. ), Eustoma violet(3 pt. ), Greens(1 pt. ), Packing(1 pt. ), Tape(1 pt.). 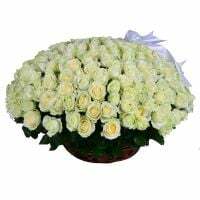 Business, , Colleague, For grandmother, For her, For mother, For young lady, Gratitude, I Miss You, Mother-in-law, Recover, Sorry, Wedding flowers.